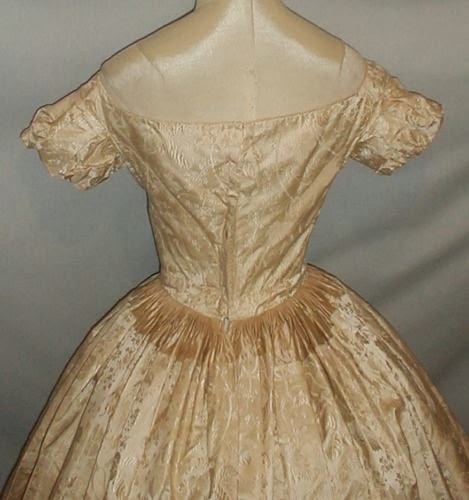 An exquisite 1850-1860 ivory satin brocade ball gown dress that has recently been de-accessioned from a museum collection. The cataloging tag is stitched inside the bodice.. 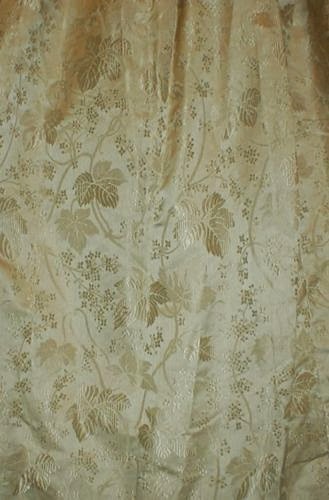 The fabric has a leaf and tiny floral pattern. The fabric has a changeable quality depending on the light reflection. 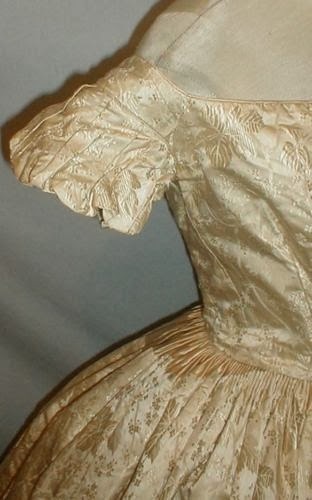 The bodice has short puffed sleeves. The neck and armscyes are piped. It is lined with cotton and has a back hook and eye closure. 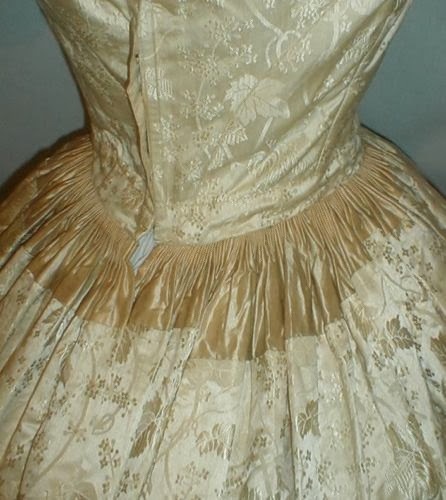 The skirt is attached to the waist with cartridge pleating. There is an area around the waist that is made of solid colored satin fabric. The dress was probably originally worn with a peplum style belt that would have covered this area. The skirt is fully lined with cotton. The dress is in very good condition. There is some very slight underarm discoloration, a nickel size age spot on the front of the bodice that is very light in color and a small area on the lower skirt front that has several dime size age spots and one quarter size age spot . 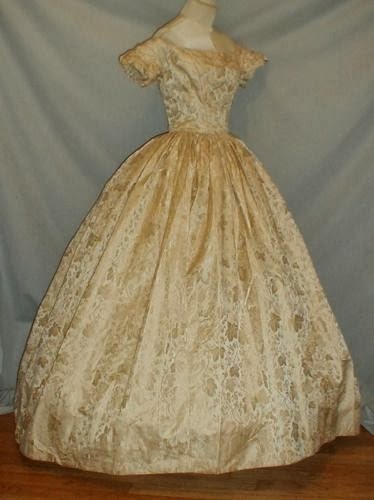 A magnificent display dress. Bust 30 Waist 23 Skirt length 40 Width at hemline 136. 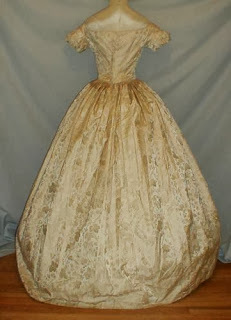 I believe this was an 1840's gown that was taken apart, shortened, and sewn back together. 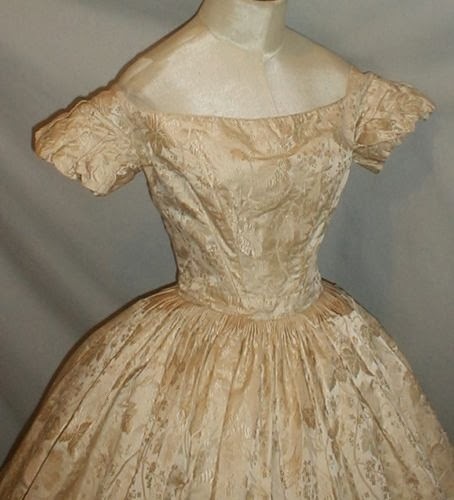 You can see a similar cut 1840's gown in the fashion plate below. The main difference between the two is that the bodice is shorter. This would make sense for a poorer lady during the 1850's - hence no change in the skirt either. The fabric is also one that was popular during the 1840's - changeable gold colored fabrics were sort of the "little black dress" of the 1840's. It does give me the impression the front point was cut off. I do love that fabric. But all those cartridge pleats! Eek! What really struck me as odd is the pieced patchwork in the back of the skirt. You'd need some sort of overskirt/ribbon/something to cover that up. It's obvious and I don't quite get why it's like that. If it were for a later 1860's style, then the front of the skirt would be flatter, causing the volume of the skirt to go back - but none of that here. It's just very round.